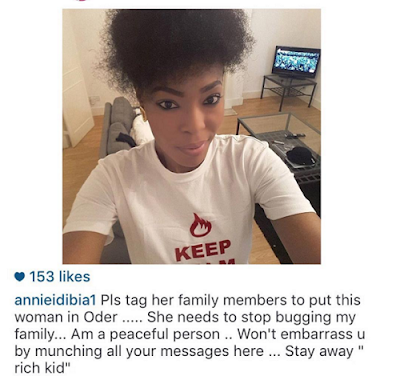 Few minutes ago, Annie Idibia took to her IG page to warn the lady you see above to stop disturbing her family.She asked people to tag her family saying she is a peaceful person and she needs the lady to stop bugging them. We guess it's not Tuface that the so called lady is disturbing o, han han that won't be fair. The couple have been living peacefully now with no dramas and i guess every lady should let them be.